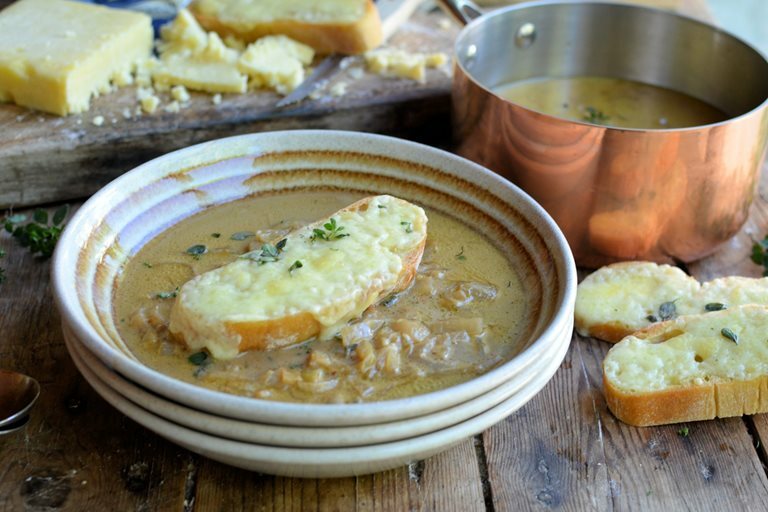 Based on the classic French onion soup, Karen's recipe has been lightened up and Anglicised by making it with English cider and Cheddar cheese from Cornwall. As we slide from summer into autumn, I find I am turning towards casseroles, soups and stews for family weekday suppers, although I am not into dumpling mode just yet! Soups are a perennial favourite of mine, not just in the cooler months, but also when served chilled throughout the summer, but, there is something very comforting about a steaming bowl of hot soup on a blustery autumn day, and especially when the soup is topped with bread and cheese. The recipe I am sharing today is just fabulous; based on the classic French Onion soup, my recipe has been lightened up and Anglicised by making it with English cider and Cornish Cheddar cheese. 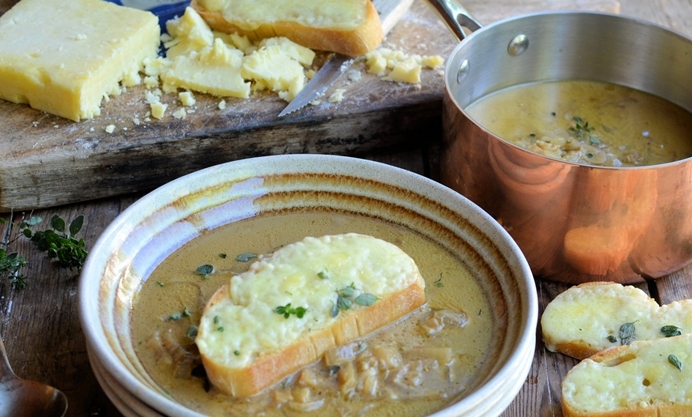 The cider and onion soup is slightly creamy too, making it more velvety and silky, plus the crouton on top is made with chewy sour dough bread in place of the usual baguette or pain…..it’s light enough for an Indian summer’s day and yet will tick all the “comfort food” boxes for the winter. The recipe is easy to make and a bowl of this fragrant soup would make a welcome supper (or luncheon) dish any day of the week. If you are really concerned about using cider for the children, then you can substitute apple juice in its place. I hope you all enjoy this soup recipe as much as we did one cold and windy autumn day last week. One last tip, if you are a lover of all things cheesy, then make some extra grilled cheese croutons and pop them in the middle of the table for extra dunking and dipping..…..an extra slice will also turn this light meal into a main meal too, plus we all love a good cheese on toast!